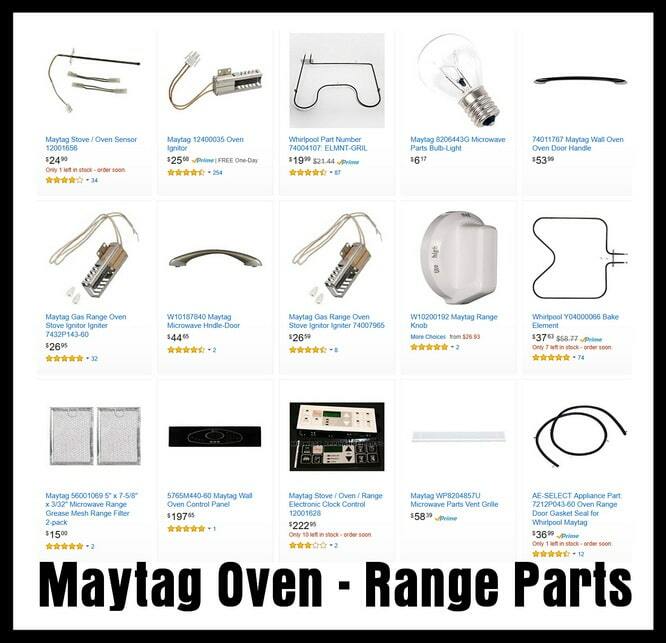 What does the error code mean on my Maytag oven, range, or stove? 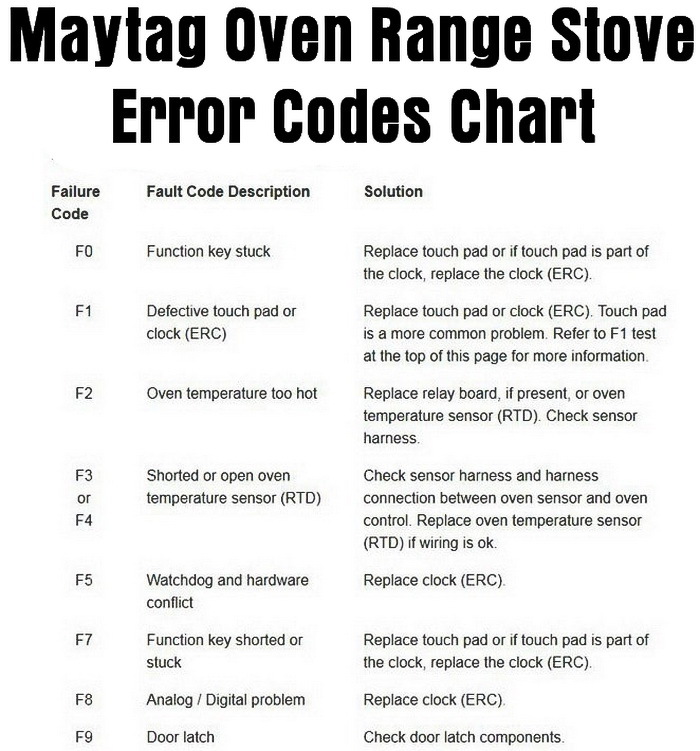 If your Maytag Oven is displaying a code on the display, these fault/error code definitions will help you to find and fix the problem by identifying which part is faulty. 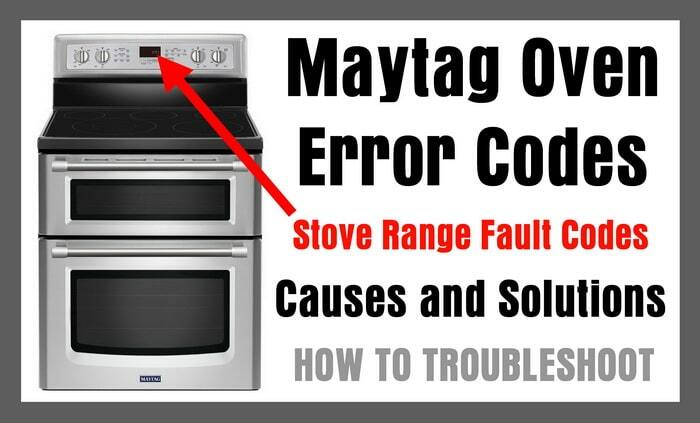 Be aware that the cause of many of the error codes the Maytag Oven will display is because the timer itself is at fault. 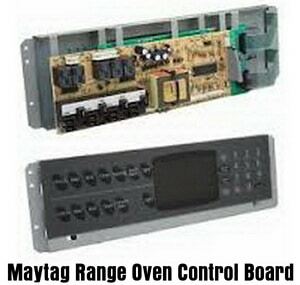 The proper name of the timer on your Maytag Oven is called an Electronic Range Control – ERC. We will explain more about the ERC below. If you need any assistance troubleshooting your Maytag Oven, please leave your question below with the model number of your Maytag Oven and the exact error code that is displaying on the Oven’s display. Causes and Solutions – How To Fix? What To Replace/Clean/Check: Replace touch pad, timer (ERC), membrane. This error is most always the touch pad. SAFETY NOTE: Use caution when repairing or troubleshooting your Oven as high voltage is dangerous. 1 – Unplug or flip breaker and remove power to the oven. 2 – Access the back of the electronic range control “clock” or ERC. 3 – Unplug the touch pad ribbon connector from the electronic range control. 4 – Clear all so the Oven will not electrically short when power is regained. 5 – Replace any of the covers that were removed to access the electronic range control. 6 – Turn power back ON to the Oven. 7 – Watch for the F1 error code and listen for the beeping sound. 8 – If the error code F1 reappears and beeps then replace the ERC (electronic range control). 9 – If after 1 to 2 minutes after applying power back to the Oven, you DO NOT get the F1 error then replace the touch pad. 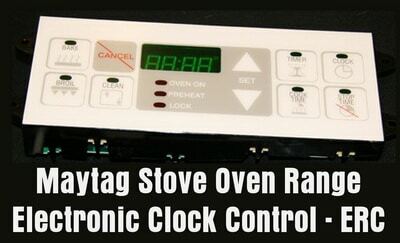 SIDE NOTE: Some Maytag Oven models have both the touch pad and the clock control as one part. This means the F1 error code indicates a faulty bad clock control. What To Replace/Clean/Check: Stuck relay – check relay or replace. What To Replace/Clean/Check: Remove power until fixed. If you need any assistance troubleshooting your Maytag Oven, please leave your question below with the model number of your Maytag Oven and the exact error code that is displaying on the Oven’s display. We have only had it for about a year. And it has contact service F1E1. What does that mean. We’ve tried clearing it but disconnecting the power and it come back. We didn’t just do a self clean. But did use the oven last night. I’m getting a F11 code. Your chart does not go that high. Is there a new chart? What causes the F11? My Maytag model MES5570AAB has an F1 error code AND the fan runs continuously. It first occurred after using the oven, then starting happening while using the stovetop. Disconnecting & reconnecting the power doesn’t always help – I disconnected power for 2 days and the fan started running as soon as it was reconnected. Would ERC be causing this? My Maytag Gemini won’t stop beeping it does not show a code just tells to remove rack & set for 3 hrs. I believe the top oven is trying to self clean. I have tried to unplug it for a day & it does the same thing when I plug it back in. Please help! Oven only shows these when I engage a heating element. Otherwise screen is dark. I have a maytag stove and the front burner when the “element” comes on (turns red like it is heating) there is a noise like a low screeching noise and I don’t know what is wrong with it. I have a and if so what is the approximate price of this Maytag stove that the alarm keeps going off and flashing a F 11 code. I can not find anything on the F11. Is this needing a ERC replacement and if so what is the approximate price for this. Maytag Oven says testing OU when door closed. Can you tell us the model number of your Maytag Oven? Does the oven work despite the error codes? Next post: Dishwasher Turns On And Starts By Itself – Causes and Solutions?